I have made a bit of sausage in my time. And alot of it has been fresh Italian. However, I will no longer be mixing my own spices for this, because Checkered Past’s mix is better than anything I have made. Top quality mix…a little heat, low fennel content- just a well done Italian mix for 25 pounds of meat. Or…1.5 tablespoons per Lb for smaller batches. This stuff is outstanding! 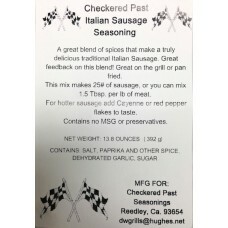 I have been using CP’s Italian Sausage Mix for a handful of years now and I keep coming back for more. I recently filled my elk tag and I had to make a fresh batch if Italian Sausage. I mixed it 50/50 by weight with pork but and added the seasoning package after the coarse grind. After the fine grind the test fry was as usual outstanding! We had to have spaghetti for dinner with fresh CP Italian Sausage.